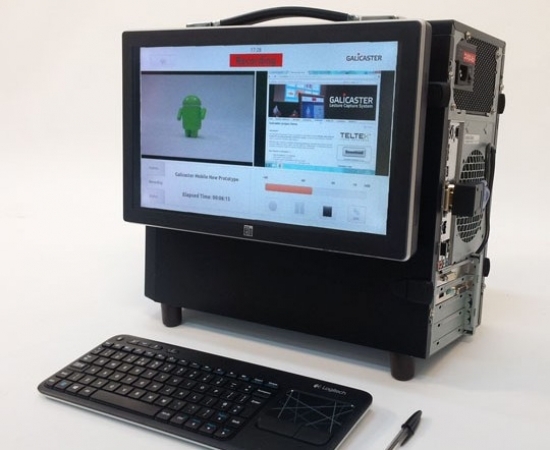 GaliCUBE2 is a fully featured, portable, multistream recording and live streaming station designed for mobile operation. At first glance, CUBE2′s main characteristic is its case-integrated 15.4″ wide touchscreen and wireless keyboard, which significantly reduces the space and time needed for setting up the recording station. Altogether, Cube2 provides mobility and a quick setup with minimun wiring. From a hardware’s point of view, it is a powerful, extremely silent, heavy-duty unit, based on an Intel i7 processor. GaliCUBE2 can be connected to an Opencast Matterhorn cluster, thus providing a full remote scheduling system as well as automatic uploading, enrichment and publishing.